For the last two and a half years Sue Fitchett, a Hauraki Islands Forest & Bird committee member has been collaborating on a brochure with the Waiheke SPCA on how to be a responsible pet owner. Here she tells us more about this often controversial subject. Yes, two and a half years is a long time for any brochure to be put together but pet control can be a controversial subject – especially issues like putting a collar and bell on your cat. There’s also the subject of animal welfare – the welfare of avian wildlife balanced against the rights of all animals to express their natural behaviours and live with ‘five freedoms’ – the internationally recognised animal welfare standards. Needless to say, compiling the “Working together towards responsible Waiheke pet ownership’ brochure was a true exercise in trust, consensus and goodwill that had to balance the welfare of all wildlife on the island. 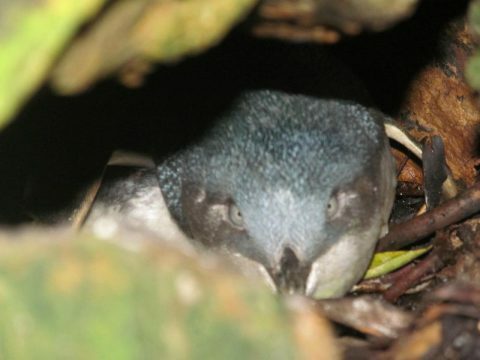 I first began advocating for the island’s avian wildlife when I started monitoring our little blue penguins. Nationally Forest and Bird and the SPCA has an online document on pet ownership which includes humane treatment and wildlife protection, but here on the island we felt we had particularly localised issues. In particular there is a big problem with abandoned cats living in bush or rural areas of the island. On our coasts and in estuaries we have threatened avian species such as Little Blue penguins and banded rail that at risk from ‘off leash dogs’ and cats as well as the usual stoats and rats. Feed your cat well with a complete and balanced diet and ensure your cat is appropriately fed while you away on holiday (either at home or in a cattery). Do not take your cat away with you to conservation areas on or off-island. Provide moving toys for your cat to play with to reduce boredom. Keep your cat indoors at night (native wildlife are particularly vulnerable at dawn and dusk). NEVER abandon a cat. Abandoned cats are too numerous on Waiheke. If you cannot keep your cat for some reason, the SPCA can help you with this. A bell and collar reduces wildlife predation. Protect native wildlife in your garden by locating bird feeders away from cover where a cat might hide and putting animal guards around trees where a nest is seen. I’m pleased to say that we’re continuing to foster collaboration with the SPCA on other projects. When the first breeding pair of kaka were sighted on the island, this was an opportunity to work together. We set up a ‘protective steel ring’ around the kaka nest which included live traps. The SPCA became foster carers for any cats caught in these traps and we kept them in the loop in relation to ‘rat control’ halo areas and other ‘pest animal’ control. Over Labour weekend sees the culmination of this project as every household in Waiheke will receive a copy of our brochure. Thanks also to The Hauraki Gulf Conservation Trust who has helped us to fund this and whose dream it is to bring about a pest free island. Sue Fitchett is a Hauraki Islands Forest & Bird committee member and a QEII covenantor. Sue Fitchett has contributed 1 entries to our website, so far. View entries by Sue Fitchett. Fantastic! Pretty much common sense and very good ideas. I already do all this with my cats except for the bell & collar . I have planted trees & it has taken me 3 years to get Tuis, Bellbirds & Waxeyes coming for the sugar water I put out for them, as well as the native Fuschia trees, Corokias, Kowhai, Lacebarks, Cabbage trees, Flax, Clematis Paniculata etc. They also like the Chilean Firebush, Weeping Willow, and the spreading double Flowering Cherry in full flower at the moment. All my cats have grown up using the trees as their jungle gyms, but along with my Bantams there are so many birds around (including Sparrows, Finches, Blackbirds, Starlings, Thrushes and occasionally a Fantail), that they don’t bother with them, while still having the best possible life. All this in a town section in Invercargill. It’s about the short-tailed bat and its predators, rats, stoats and cats. re the’ SPCA became foster carers of any cats caught in the traps? set around the breeding Kaka on Waiheke. Im really interested in how many cats were caught.